After Brexit – What will become of Europe‘s foreign and development policy? The United Kingdom is one of the four principal actors of European development cooperation. Thus, Brexit will have significant consequences for the future of Europe’s global role. This situation was the backdrop to a panel discussion of the series Bonner Impulse on 27 February, which focused on the future relationship between the UK and the EU in matters of foreign and development policy. The event series, which is co-hosted by German Development Institute / Deutsches Institut für Entwicklungspolitik (DIE), the European Association of Development Research and Training Institutes (EADI) and the umbrella organisation of development and humanitarian aid NGOs in Germany VENRO, regularly invites experts from politics, academia and civil society to discuss sustainable European development policy. That Wednesday evening, around 100 guests did attend the discussion that took place in the auditorium of the Kunstmuseum Bonn. Moderated by DIE’s EU expert Christine Hackenesch, the panel featured MP and deputy group chairman of the FDP in the German Bundestag Alexander Graf Lambsdorff, Pedro Morazán of the Südwind-Institut and Stefani Weiss of Bertelsmann Stiftung. The focus of their discussion was the state of the Brexit negotiations and the common external interests of the EU and the UK. 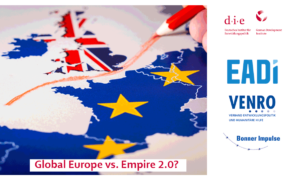 Numerous audience questions and comments pertaining to the political motivation behind Brexit as well as the pragmatic political consequences of the UK leaving the EU, showed that Brexit is on the minds of Bonn’s citizens. We asked the experts for our video series „Perspectives On“, what they expect to change for Europe‘s foreign and development policy after Brexit.